Dattatreya is the Grand Teacher or "Guru principle" in the universe. The teachers in various planes are the manifestation of the one teaching principle who is referred to in the ancient Indian wisdom as Dattatreya. Athri and Anasuya are said to be the parents of Dattatreya in the Indian mythology. This is again an Eternal Principle of Saswatha Dharma. That which is beyond the three, as said before, is A-thri, the pure consciousness is called Athri. The pure consciousness details into the three aspects of consciousness as: Will, Knowledge and Activity of Itcha, Jnana, and Kriya Sakthis. The three come together to lace the creation with their three qualities. The three qualities relating to them are: dynamism, poise and inertia, or rajas, satwa and tamas. Basically their corresponding colours are: red, blue and golden yellow. The lacing is done through these three qualities and colours along with the related sounds and numbers. As a result the creation happens with all its planes of existence. The pure consciousness pervades all the planes of existence worked out by the triple quality, just like the cotton exists in the coloured threads of cloth. The cotton is the essence of the cloth, likewise the consciousness is an emergence from Pure Existence. The poised creation and the poised being are the result of a synthesis of the three qualities, where the three are equally oriented to eachother and no one dominates the other. This synthesis of the three qualities is also called the state of equilibrium relating to the three qualities. This state is geometrically described as the equilateral triangle. When the three qualities are thus equally poised and oriented, they consequently form into an equilateral triangle, and that state is called the state of no-malice. Anasuya in Sanskrit means: "not Asuya". Asuya means malice. Dattatreya is said to be born to Anasuya, the Mother and Athri, the Father. Athri, the Father, is said to be the pure consciousness and Anasuya, the Mother, is said to be the state of no malice (jealousy). The state of Anasuya is depicted as an equilateral triangle and the state of Athri is depicted as a centre within the circumference. This is the essential principal relating to the state of Dattatreya, that is: pure consciousness expressed through equated qualities. He is beyond the Trinity but can equally express through the Trinity. He is therefore creative like the creator Brahma, preserver like Vishnu, and can also be the destroyer like Siva. As pure consciousness he can be like the Divine Mother and as Pure Existence he can be the God Absolute. He is potent with all possibilities. That is how he is conceived by the seers of ancient times, as "all in one and one in all". Athreya means in Sanskrit "the son of Athri". Athri is one of the 7 seers / principles of creation. Athri also means in Sanskrit "not three". The one who came down from that which is not three is called Athreya. Datta in Sanskrit means: "The One that is donated". Thus, that which is not three, is donated trough the three into all the planes of creation to help the beings to find the Path back to Truth. That which is not three means: "that which is beyond the three". The three are the three basic Logos, the Trinity of every system, that is: Divine Will, Love- Wisdom and Divine Activity. That which is beyond the three is the pure consciousness, which manifests through the three qualities of itself. The whole creation is a triangle of forces. The One that is beyond enters into the triangle of creation and helps the creation. He exists in all as the pure consciousness beyond the triple quality of the individual. It is the divinity in every being. Dattatreya is thus the principle, which exists in all as the Teacher principle, as the friend, as the guide that leads one unto one's own source of Existence. Dattatreya is an Eternal Principle. Dattatreya also exists in a form in all planes. Just like the World Teacher is the principle that guides the beings of this globe, Dattatreya is also a principle that incarnates as per the time and need in any plane of existence. The planes of existence are made out of the disturbance to the equilibrium of the triplicity. The subtle worlds are more of light, the gross worlds are more of matter. The former carry more of dynamism and the latter carry more of inertia. The beings in the planes also suffer such lack of equilibrium. The path of yoga, for each being, is to' regain such state of equilibrium. In the one who gains equilibrium of the three qualities, poise presides, and he would even ascend further into the realms of Truth. In such a state there are no instincts of desire, anger, illusion, pride, prejudice etc. This state is referred to as the yogic state. In this state, happiness is natural and need not be sought after, it is the natural joyful state. When desire emerges, it is rajas that takes hold and causes dis-equilibrium. Once the equilibrium is lost it takes lives to gain back that blissful state. Imagine a still, pure, water lake. If a pebble is thrown into it, it creates circular ripples. The ripples go up to the shore and come back, and again go forth, according to the depth of the disturbance. The depth of the disturbance depends upon the intensity of the desire. The "ripple state" is called Asuya, the "none ripple state" is called Anasuya. All mortals who suffer the illusion of death and birth and who also suffer the pairs of opposites, are the ones in whom the three qualities have not regained their state of equilibrium firmly. Dattatreya is firmly anchored in that state and hence he is the source of inspiration and is also the Path for people who seek to balance their vibration. The symbol depicts an equilateral triangle within a circle and a central point. Dattatreya forms the path of yoga for the benefit of the beings. He is evoked by the seers, since ancient most times, by this symbol. Figuratively Dattatreya is depicted as having three-heads. This is to indicate that he is the deity in whom the Trinity is synthesised and that he presides over all the three qualities of the soul. The figurative aspect of Dattatreya was poetically conceived by the seers, which would be explained hereafter. The equilateral triangle was the basis of wisdom in all ancient wisdom schools. Attaining the poise relating to the 3 qualities is the basic work for all advanced courses in wisdom. Devotional application of the fundamental tenets in daily life was therefore given by every exoteric teacher. All esoteric teachings are based upon the effortless adoption to the exoteric teachings communicated by all the exoteric doctrines of all communities, at all times. The fundamental tenets of every religion, therefore constitute the preliminary basis. The focussed and one pointed attention towards self-attainment is the next step, where the 3 qualities are required to be worked out. If they are not worked out, the basis is not formed to gain the esoteric knowledge. The equilateral triangle is therefore seen as the door into the esoteric wisdom. The point in the triangle is the aperture that leads one to the other side of himself. This is the wisdom of the triangle called Thrayee Vidya, The Holy Trinosophia is the Greek ' name to it. In ancient times there was enough exchange of social, cultural and spiritual activities between India and the Middle East. That great Initiate called Pythagoras is said to have learned the key of triangles from Thrayee Vidya and founded his schools in the Middle East in the name of "Holy Trinosophia". The Thrayee Vidya is the basic key to all wisdom and can unfold the secrets of every plane of wisdom as per the intent and intensity with which it is learned and applied. The triple qualities fabricate the 7 planes of the creation, which are explained as the 10 seeds. The decad is the ancient most symbol of Dattatreya in its numerical and geometrical form. Its pure geometrical form is the triangle within a circle with a centre, its figurative and poetic and more elaborate form is what is given as the man with 3 heads, 6 hands, accompanied by a cow and 4 dogs. He holds 6 different weapons in 6 different hands. The above will be explained in a short while in the book. The decad is briefly explained hereunder, while it is a treatise by itself. The 3 extreme points of the decad represent the 3 qualities of the soul, the Trinity, the 3 Logos. The 7 points in between represent the 7 planes of existence and all that which is represented by 7. The central point is surrounded by 6 points, which explains the individual soul with 6 centres of working. The 10 points together form the Universal Soul, and the central point represents the individual soul. Between the individual soul and the Universal Soul there is the triplicity and the planes of existence. It is also a more detailed symbol of the Cosmic Person. It will be further explained in the chapters to come. The Cosmic Person is said to have come down in 10 steps and presides over creation. To that Teacher, I offer my salutation. Thus, the One Teacher/Master of the universe is invoked through every teacher/Master. The Teacher is always One. The individual in whom the equilateral triangle is built, and who transcended the 3 qualities, contacts the most sublime energy of the Guru and therefore becomes himself an outpost to the One Guru. Verily an individual teacher is a representation of the Teacher and The Master, hence all forms of teachers should be accepted and respected as the forms of "The One Teacher". The One Teacher radiates through all such accomplished beings. Guru also means, "the One who causes recollection". The True Teacher, Sat Guru, has only one mission to accomplish, that is, to recollect to eachone that gather around him his real state of being, or the original state of being. In other words, the secret mission of the teacher is to recollect to every being that it is a being of light and nothing less than that. He lays the Path giving the means to every being, so that the aspiring beings, can function as per the given code and realise themselves as beings of light, beings of pure consciousness, immortal and divine. This mission, is carried out by Sri Guru Datta with an army of accomplished beings, in all the 7 planes of existence. At every plane of existence there is the teacher principle, functioning through certain beings. The essential quality of the teacher is compassion, Dakshinya. He is compassionate towards the beings, never judgmental. He knows that those around him hold on to different states of awareness and compassionately guides them towards their goal. A true teacher never believes in punishing, for him every being is a being of light, a divine being and hence he cannot but be friendly and compassionate towards their ignorance. It is believed that when the Lord made the creation. He introduced Himself into the creation as Dharma. The beings in various planes needed to be guided back unto their original state. The planes of existence were created, the beings related to every plane were created and the Dharmas were enunciated. But then the need was felt by the beings, to be guided in terms of their Dharma. For that reason, the seers worshipped the Lord and invoked Him as the Teacher. Out of compassion, the Lord Absolute Himself, came down as the Teacher to be in the creation and to guide. He thus, made a second descent into the creation to be the Teacher, out of compassion for the beings. He has, thus, donated himself into the creation for a second time and therefore is called Datta. The Teacher has no judgmental faculty. He is beyond the pairs of the creation and is therefore equally compassionate to all beings in the creation. He is Teacher to the divine, to the human and to the diabolic as well. This is a dimension, which cannot be understood by people who live by bifurcating the creation into good and bad. One needs to anchor in the energy of synthesis to realize that the pairs have their source in the same principle. Light cannot exist without its shade. Day cannot exist without the night. Full moon is counteracted by the new moon. Likewise, goodwill shines on the background of evil. Imagine a parent that has three sons. One is good, the other is bad and the third is average (semi good and semi bad). From the standpoint of the parent, all the three are his children, he is equally affectionate to all. In fact, his concern for the second son is much more than his concern for the first son. The second son needs to be helped more than the others. The life of Jesus the Christ, in recent times, clearly gives this message as he allowed himself to be in the company of the downtrodden and the fallen ones. He strongly advocated that they needed him more than the others. The teacher cannot reject some and prefer some others, he has no preferences. His love and his enlightenment emanate from him with equanimity, like the sunray or the magnetic currents. The receptive ones receive differently according to their fitness and ability. Dattatreya is therefore as much a Teacher to the divine as he is to the diabolic, besides the human. It is also for this reason that he is depicted as holding the 3 heads. There are beautiful stories in Srimad Bhagavata about the Teacher being present in all the 3 worlds and guiding them as per their objectives. Sri Guru Datta was found to be doing so by the King Celestial Indra. Indra was surprised to see that Sri Guru Datta was sharing knowledge and giving guidance to the diabolics also. He got disturbed because his Teacher is also a Teacher to his opponents! It is common that aspirants, who style themselves as disciples, don't feel happy when their co-aspirants, whom they do not like, are also entertained by their teacher. The teacher is beyond all partial attitudes, as he stands for synthesis and in synthesis. The petty quarrels and the jealousies are with the ignorant ones who always try to show one-upmanship. Sri Guru Datta is known to be Trisira, three- headed. He is called Brihaspati (Celestial Jupiter) in the divine kingdom, Kapila in the infernal kingdom, and Sri Guru Datta in the human kingdom. He permeates the whole creation as a teaching principle and is the backbone of the Hierarchies of various planetary and solar systems. Sri Guru Datta is accompanied by 4 dogs, in his figurative symbol. These 4 represent the 4 Vedas the 4 Yugas, and the 4 states of the Word. They also refer to the 4 states of Existence. Rig Veda, Sama Veda, Yayur Veda and Atharva Veda. Krita, Treta, Dwapara and Kali Yugas. Para (beyond), Pasyanti (perception; Madhyama (conception), Vaikhari (vocal). Existence, awareness, thought and speech or action. The whole world is the product of the Word. It emanates as the soundless sound Nada (OM) and further descends as the life principles (vowels), the formative principles (consonants) and the varieties of formations (words, sentences, and scriptures). Thus it is the Word that manifests in its detail, according to a Plan, which can be known trough 4 keys namely: the number key, the sound key, the colour key and the key of symbolism. The ancient seers have visualised the creation and its 4 aspects, which is a popular division. The cross of the west also has its origin in the key of the fourfold division. There are many ways to explain the creation by dividing it into its 4 aspects. The Vaishnavits called the 4 states as: Vasudeva, Sankarshana, Pradyumna, and Aniruddha. Vyuvahas. The same 4 states are explained as Paramasiva, Sadasiva, Isvara, and Rudra by the Saivaits. By the followers of Sakti (power) these 4 states are called; Para Sakti, Itcha Sakti, Jnana Sakti and Kriya Sakti. The wisdom coming from the Hierarchy through Master Djwhal Khul today, gives a new terminology to it as: Pure Consciousness (Soul), Will, Love-Wisdom and Intelligent Activity. As said earlier, the Christians conceived the fourfold Existence and adopted the cross, which is again a Vedic symbol. They have also conceived 4 gospels, to fall in tune with the 4 Vedas (the 4 Vedas speak of the 4 aspects of the Lord, while the 4 gospels speak the same story of the Initiate Jesus Christ). The 4 Vedas speak of the expression of awareness as Rig Veda, the Song of Life as Sama Veda, the plan of work as Yayur Veda and action and the related manifestation as Atharva Veda, in great detail. They are not comparable to the 4 gospels. Rig Veda speaks of the emergence of awareness, its ideation as divine thought and its manifestation as speech. Awareness emerges from Existence, details into Trinity and utters forth the 7 planes of existence. This is the work of the Word which is elaborated in great detail in Rig Veda. Even in the human being, his awakening, his perceptions (inner and outer), his conceptions, his speeches and actions are nothing but the uttering forth of himself. This is the Rig Vedic part of him. The Sama Vedic part in the human being exists as Nada, which details into life force, conducts pulsation, heart beat, respiration and circulation of blood. The Yayur Vedic part in the human being is, making a plan out of ones own conceptions before been executed. Unless there is a well laid out plan for action, the actions do not yield the related joy. Yayur Veda speaks of such plans before every action. The Atharva Vedic part in the human being are his actions and the consequent creation, which is his. As it is with the Lord so it is with man. The knowledge relating to the 4 aspects relating to man in its detail would lead him to himself. To indicate that all is fourfold, the 4 dogs are depicted as moving around the Lord, this is only a partial understanding of the 4 dogs. The dog is one of the sublime symbols of the Veda. The dog represents the faculty to listen, to listen far, and to listen to the subtle. The dogs have a better ability to listen than the humans. They are alert to listen and are also able to listen much more than the humans. In the esoteric practices, one of the foremost practice is, to make the student listen, more than speak. To listen far, to listen to the subtle, would lead one to clairaudience, and it would further lead to listen to the Voice of the Silence. Listening to the Voice of Silence is called listening to Anahata the Heart Centre, where the subtle sound coming through the ether can be received and perceived. All great Initiates listen to the silence within and express the Plan as is impressed on them in silence. Impression from the subtle planes is possible only if one is alert, able and oriented to silence. The dog represents such an orientation and the impression comes from higher circles. Astrology says that all impressional teachings are the work of Jupiter, whose name in Sanskrit is Guru, thus, it is the principle of Guru, only, that causes impressions upon the well- prepared beings. In recent times, the impressional writings are well demonstrated by Madam Alice A Bailey. She oriented to enough silence to be able to listen to the impressions that came to her, from Master Tibetan. She was able to record the ancient wisdom in great detail to enlighten the average intellect of the west. Even in the Greek system there is a three-headed dog that keeps vigilance at the gates between heaven and hell. He is called Hydra, which is significant in this context. The dog is the symbol of vigilance, depending upon the quality of utterances that one makes he would either open the gates into heaven or into hell. It is for this reason, prayers are recommended to be uttered loudly by the aspirant in its 3 levels and listen to the import of the sound uttered forth. The import of sound in prayer, is God, while the 3 levels of the physical sound represent the three-headed dog. Leo is called the dog in the Vedic symbolism. In its higher function, Leo is called lion. There is a great significance in Leo being called the dog, for Leo and Scorpio are related to the Dog Star. The Vedic symbolism relating to the dog relates to the Dog Star. The Dog Star Sirius is locationally in Scorpio and functionally enters into our system through the Central Sun of Leo. To the students of esoteric astrology it is clear that the Sirius system constitutes the Teacher principle to our system, while the Great Bear and the Pleiades play the role of the Father and the Mother. The Vedic seers conceived the energy of love and compassion, which are received into our system as coming from Sirius. In the Vedic system, Sirius is called Sarama. Sarama means dog. Sirius is called the Dog, both, for its appearance from this Earth and also for its functional aspect. The Divine Plan for our system is first received in Sirius and then transmitted into our system. Systemically speaking, the impressional work relating to the evolution of our solar system is conducted by Sirius. Even the Avatar of Synthesis who is to come, is predicted to be entering from the south, for south stands for the sun-sign Leo, of love and compassion. Leo in man, is the Heart Centre, which can unfold love and compassion. The most profound Truth relating to the Avatars and the related evolution of our solar system are hidden in Sirius. Sarama is the familiar sound among the Eastern Indians and the Central American Indians. In Central America, amidst the Amazon forest, there are Indian tribes who are called Saramas (Shamans) meaning, the priests who can listen, get impressed from higher circles and conduct healing. Sarama in India is called Sarma, he is the ritualist who listens to the higher circles and utters forth the hymns to benefit the human folk. He is a teacher, a healer a guide and philosopher in the ancient Indian communities. The symbolism of the dog is too profound to be explained in its completeness. We leave the dog at this junction, to be pursued further, intuitively, by the inclined student. The replica of the Sirius System on this planet is the Hierarchy with its ashrams in the Himalayas and the Blue Mountains. The head of the Hierarchy, Lord Maitreya, is believed to be in tune with the Lord of the Sarameya (Sirius System), whose Lord is Dattatreya. Dattatreya is the Head of the Great Grand Lodge of the White Brotherhood on Sirius, while Maitreya is the Head of the Great Grand Lodge of the White Brotherhood on this planet. Together they are steering the energies of Neptune, for the benefit of this planetary evolution. Dattatreya is accompanied by a healthy white cow. The cow is under the protection of Sri Guru Datta. In the Vedic symbolism, the cow stands for the creation and also for our planet Earth. The planet and the creation offer innumerable wealth, pleasure experiences, happiness, joyfulness and bliss. The planet nourishes the beings of the planet. The creation nourishes the beings in creation with its milk. The planet and the creation are willing to be milked, to nourish the beings in all planes of existence. The drinking of cow milk is symbolic of such nourishment, growth and contentment in the physical, vital, mental, buddhic and blissful planes. The creation is made for the joy of the beings. The joy is in right action towards the cow, which is symbolic of the planet and the creation. It is for this reason, the cow is considered sacred and is respected, worshipped, protected and fed well before one uses its milk. It is a matter of culture that man should gain this delicate understanding of life. Though he is intellectually advancing, there is a very tangible and perceptible fall in his understanding of life and the delicacy relating to it. Culture demands delicate handling of everything in creation. The very meaning of culture is lost and it is about time that man looks to the art of living. The status that the cow has in a society decides the cultural status of that society. Where the cow is insulted, such society is destined to lose the secrets of life. It is beastly to ruffly handle the cow, abusing her through technical knowledge, to draw excessive milk by feeding all un-hygienic and unhealthy food, is monstrous. Man today abuses the cow in every conceivable way. It depicts his cultural fall. The cow, the woman, the planet, the solar system and the cosmic system are the different states of the cow principle. By right approach and right attitude towards them, man gains the splendour of life. By wrong approach, man is bound to fall and suffer. The ancient Indian Scriptures proclaim that: no one who intends to live in peace can afford to hurt a cow, a woman, the planet (of course he is incapable of hurting the solar system and the cosmic system). If one worships, protects and nourishes the three, they get favourably inclined towards the one. Their favourable inclination gives to the one the inexplicable joy and the pleasure of being. It is for this reason Dattatreya is depicted as protecting the cow. The cow follows him in all ways. The cow is the giver of all fulfilment, joy, happiness and experience and it follows Dattatreya. In the Indian mythology, Sri Guru Datta and Sri Krishna are the only ones shown as accompanied by a cow. There is profound significance in such depictions, both of them represent the one teaching principle in all the three planes of existence. Sri Guru Datta, being three-headed, is creative, preserving and annihilating. So is Krishna, who demonstrated creativity like the creator Brahma, protection like the preserver Vishnu, and annihilator like the annihilator Siva. Sri Guru Datta is the Master of yoga in creation and Sri Krishna gave out the science of yoga through the Bhagavad Gita. The Bhagavad Gita is a synthesis of Brahma Vidya, Yoga Vidya and the Upanishads. All that which is mystically depicted as Sri Guru Datta, was in its full manifestation in flesh and blood as Sri Krishna. The cow that follows Sri Guru Datta or Sri Krishna, is the most mysterious cow, capable of performing most wonderful acts. The cow, for instance, conducts the secretions from the glands of the beings. The secretion of the pineal, pituitary, thymus, thyroidal glands etc., are presided over by the cow. The blissful experience of the celestial musical tones and the consequent ecstasy, is also the work of the cow. Permeation of life and awareness through the solar ray, is also conducted by the cow. Digesting food and drink and transforming the essence of them into blood cells, which form the basis of health, is also the act of the cow. Transforming the blood tissues into the tissues of milk in the mothers, is also the sublime action of the cow principle. Cow is thus the basis feeder of all. Invocation of the Word into will, thought, expression and action, is also another way of milking the cow. Those who are capable of receiving the impressions of higher circles, are the ones who can milk the ancient wisdom for the benefit of the fellow beings. To sum up, the entire chemistry of the creation is presided over by the cow principle. Such is. the profundity of understanding of the cow by the Vedic seers. The cow is called GO in Sanskrit. GO is a compound sound of GA and O. GA stands for Jupiter and O stands for Sun. If the essence of the two planetary principles is well understood, the cow is understood. As said earlier, the cow presides over the secretion of glands. In the science of yoga it gives the related practice to enable the thymus and the pineal glands to secret, which normally does not function in ordinary human beings. The secretions from these higher centres help preparing the body of light, which is called the etheric body in which one can dwell, transcending death. The secret of deathlessness enunciated by the grand yogis of all times, is building the Divya Sarira or the body of light. The Hierarchy consists of humans that followed the path of yoga and built their respective bodies of light. Sanaka, Sanandana, Sanat Kumara, Suka, Vyasa, Maitreya, Hanuman, are some of those who are popular amidst those that hold the bodies of light. Lord Dattatreya presides over all yogis, he is extolled as the Master of Masters in all the 3 planes, like Sri Krishna. Sri Guru Datta is depicted with 3 heads and 6 hands. In one hand he holds a conch, in the other he holds the celestial wheel, in the 3rd hand a mace, in the 4th hand a trident, in the 5th hand a water carrier, and in the 6th hand a begging bowl. The significance of the 6 symbols is briefly given here under. The Sanskrit name for conch is Samkham. SAM is the seed sound of Saturn. KHAM is the seed sound of Jupiter (for the detailed description of Samkham please look to Jupiter by the same composer). The conch indicates the principle of expansion and contraction presided over by Jupiter and Saturn. Every expansion requires consolidation and vice-versa. On the Path to Truth there is the expansion of consciousness, which needs to be consolidated at each step. It is the Law of Alternation, which works in the evolutionary and involutionary processes. The conch also stands for the sound Nada, the musical notes and all that relates to the sound. The teacher introduces the student to the sound. Basically he commences the work with the students with the Saturnian discipline. The Saturnian discipline forms a good basis for expansion of consciousness, which is bestowed by Jupiter. The teacher thus, plays the role of Saturn initially and of Jupiter subsequently. He brakes the inertia of the disciple and recruits him into works of goodwill. He causes the purification in all the 3 planes according to an order depending upon the quality of the student. He leads the student to that poise in which his inertia and activity find balance. This would in term enable the student to walk into the esoteric side of training. The wheel stands for time and time is presided over by the true teacher. He also initiates the disciple into the knowledge relating to time, so that the disciple skilfully adapts to the favourable and unfavourable periods of life, without getting disturbed in terms of vibrations through the pleasant and unpleasant events. Since the Teacher, Sri Guru Datta is "the One beyond the 3 qualities", time co-operates with him and helps him to help the seekers of Truth. A Master receives the co-operation of time. An accepted disciple learns to co-operate with time. An average person is conditioned by time. The wheel held by Sri Guru Datta is an assurance, that he would lead the beings into timelessness and the consequent bliss. The mace is symbolic of the instrument that subjugates pride. Self-pride needs to be sacrificed on the altar of service to the fellow beings and Sri Guru Datta appropriately uses the mace to put down the pride of those who follow the Path of Truth. He bestows humility, simplicity and humbleness through his training. Remember the statement uttered forth by the great Initiate Jesus: "the proud are humbled and the humbled are honoured". Sri Guru Datta /Teacher, never punishes the seekers, he is skilful enough to teach the essentiality of humbleness without punishing. Punishment does not exist with him, as he is "the Compassionate One". The seeming punishment sometimes, is a skilful upliftment of the student. With his utter simplicity he counters and neutralises the pride of the ordinary. With speeches, looks and other gestures, he neutralises the pride of those who are proud, but not crystallised in pride. When they are crystallised in pride, he works with his Siva quality, but with love and compassion, so that the soul is uplifted. The mace also symbolises the inverted position of the cerebro-spinal system, which is the abode of consciousness. If the mace is held upright, it resembles the light of the head, followed by the column of light of the spine. Sri Guru Datta, humbling the truth-seekers enables to reverse many inversions which the truth-seekers suffer from. He conducts as many as 7 reversions of inversions to make the being upright. Ordinary beings are upside down from the standpoint of knowledge. They suffer inversions and hence remain ignorant. They are illusioned by the ignorance. The mace held by Sri Guru Datta gives the message that man is inverted and that he needs to reverse the inversions. The technique of reversing the inversions relates to the yoga philosophy and the yoga practice. The trident held by Sri Guru Datta is symbolic of the triple energy held in an etheric form within the Brahmadanda. The triple energies are referred to as Ida, Pingala and Sushumna. They are the left, the right and the central energy currents. The left current causes the materialisation, the right current causes spiritualization and the central current causes the balance between the two, enabling the existence of the being in a particular plane of existence. Ida stands for involutionary energy, Pingala stands for evolutionary energy and Sushumna stands for the yogic energy which balances at every level the spirit and the matter to be in existence in that level. Astrology also speaks of a zodiac of 12 sun signs, which are essentially pairs of 6 sun-signs. These 6 sun-signs represent the 6 centres in the etheric current Sushumna, which are explained by the yoga science as the Shad Chakras. From Ajna to Muladhara, they conduct the being in all the 6 planes, that is, from mind to matter (mind, akasha, air, fire, water and matter). There is the descent of the being through the Ida current, the ascent through the Pingala current, with the Sushumna current stabilising the being at the needed level, as per the requirements of the work. The materialisation and spiritualization currents function in such harmony to give the related existence at a particular plane. These currents are like the current of the flowing river. Man feels the existence of the river while it is in eternal flow. There is water that comes in and water that departs at any particular point and in that ever-flowing flow, the existence of the river is felt, but in truth, it is the poise relating to reception and dispersal of the water flow. Such is the situation with every form in creation. The two flows of Ida and Pingala in the opposing directions are also depicted by the sun-sign Pisces. Pisces is the Alfa and Omega of the creation, it has the beginning and ending in it. Not only that, the beginning has the ending in-built in it, and the ending has the beginning in-built as well. This principle of the opposing flows in total harmony with eachother, is esoterically called by the Vedic seers as Ganga, which is called Ganges in the western languages. GA is the sound for movement. In between two GA there is the cipher, which is the source of the two and the balance of the two as well. For this reason the sound Ganga was considered most sacred by the Vedic seers. The one who is in the middle. is the poised one, the equilibrated one, the fulfilled one, who can experience the bliss in every state of awareness. This is called synthesis. This synthesis is promised to be bestowed by Sri Guru Datta. His holding the trident is indicative of such promise. The water carrier of Sri Guru Datta is in essence the life carrier. The teacher should bestow life and longevity to the student oriented to him, so that the student would fulfil himself in yoga during that incarnation. It is for this reason, a true teacher is a true healer and is even life giver. Until the student gains mastery, he would like to help him with health and longevity. The teacher bestows three essential benedictions on the student. In fact he wills them. One is longevity, another is health and the third benediction is the Path to Truth leading to mastery. Unless the student de-tracks himself from the teacher excessively, the teacher continues to bestow these 3 benedictions upon the student through looks and through thoughts. The health that he bestows is that much health that enables the student to accomplish the yoga practice attending to the daily duties. Establishing the life force firmly in the student, introducing him to the Word (Initiation), recruiting him into acts of goodwill, purifying him in the mental, emotional and physical plane, neutralising his past karma, stimulating the Kundalini energy, thereby transforming his body tissues, is the work of the teacher. He causes the birth of the etheric body, which is capable of receiving and transmitting light. He further guides the student to realise himself as a being of light in the size of a thumb finger. The way the teacher guides, is incomprehensible by the student until the student is fully accomplished. Sri Guru Datta is thus the Mother-Father principle that continues to develop the body of the soul and the knowledge of the soul until the preparation of the etheric vehicle and self-realisation. Such is the beauty of the Teacher. Lord Sankara is said to carry a begging bowl in the Hindu mythology. So also Sri Guru Datta carries a begging bowl, but he is not a beggar. To protect the beings, he begs them to donate their limitations, their impurities, their evil motives and substandard behaviours. It is for this reason he extends the hand with the begging bowl towards everyone that orients to him. He would like his followers to freely donate all that which is cause of disease so that the donor would regain the ease. Disease is bigger in dimension than sickness. One may not be sick, but yet, he can be "not in ease". Sri Guru Datta wants that the beings should liberate themselves, by right understanding, through the donation of all factors of dis-ease. In such innumerable ways, the teacher tries to help the oriented student. It is generally believed, on whom so ever the teacher spreads his blessful/blissful looks, that person would accomplish yoga in 12 incarnations! What does the teacher need to beg from the student? Nil. What does the master need from the servant? He is amidst us to relieve us from our self-conditioning due to our wrong understanding of our physical, emotional, and mental belongings. He would like us to relieve ourselves from attachment, hate, desire, anger, pride, prejudice, jealousy and avariciousness. The one who is ready to donate all these impurities of the 3 planes, would find himself like a self-effulgent gem. Then the joy of the world and the Word is his. The teacher is joyful seeing the joy of the student. He conducts all his labours to ensure that we are joyful. Due to our inversions we ignorantly, but firmly, hold on to our notions, our fears, our concepts of right and wrong, which suffocate us. He reverses these ignorant aspects and leads us to bliss. The begging bowl is indicative of such sublime activity of the real teacher. In short he symbolically drinks others impurities (poison) and bestows nectar. The True Teacher, Sat Gum, is ever alone but not lonely. He is "One in all and all in One". He has no abode, but is an abode for all. He is not stuck with any name nor has he a form. He does not belong to any place, community, nation, or race, but they all belong to him. He is parentless. He has no passion for a nation, a language, a religion and for any "isms". He interacts with all, with an attitude of love and bestows light to enable people to lift themselves up from their respective states of awareness. He is representative of the energy of the universe and hence, cannot be contained or conditioned by race, religion, caste, creed and "isms". Such should be the understanding of a Sat Guru who is a representative of Sri Guru Datta. Sri Guru Datta and Sri Krishna demonstrated life beyond concepts. Concepts are built around them by people who are comfortable with concepts. People need concepts to hold on to something, arising out of the sense of fear, desire etc. The beings look for independence/freedom, but they build as many circumscriptions around them. In desire of freedom, people build prisons around them and cry more and more about freedom. It is the work of the knowledgeable ones to live in life and to interact with concepts as per the time and the place. They leave the concept after the work is done, but do not live in them. They are only guided by the Truth and the Law. Truth is with in and beyond creation. The Law is valid until one is in creation. The Law and the Truth go together for harmonious living. "Satya Nnasti Paro Dharmaha". "There is no religion higher than Truth". Truth is that which IS. Truth, is Pure Existence that is the basis of all. To call the individual units of consciousness as "beings", is giving the message that essentially they are units of Existence, beings. Be-ness is Truth, Being is its' eternal state. Experiencing this eternal state leads one to eternity. That is the work of a Sat Guru. His main mission is to recollect to the beings their Be-ness. The Being is as eternal as the Sat Guru or the Lord. This Truth, when realised, the being is released from conditioning and from mortality. He would, through the process and practice of knowledge, realise that he is immortal, eternal, and indestructible. This is the knowledge that a Sat Guru bestows, revealing the Path to Knowledge. The Guru who does not reveal the Path to Truth is not a Sat Guru. He may be a guru relating to a concept of wisdom, a branch of wisdom. There can be gurus who promote concepts and thereby gradually control and posses people. The false gurus exist as much as the Sat Gurus. The existence of false gurus is a clear proof of the existence of Sat Gurus. How can there be a counterfeit unless there is the original? According to the sincerity of purpose and the degree of purity, one is attracted to a Sat Guru or a false guru, "birds of the same feather flock together" is a popular saying. Beings of the same quality group, gather, under a big manifestation of that quality. If one is looking for Truth sincerely and has a fairly pure life, it is likely that the intensity of sincerity would lead him to a Sat Guru. "Those who are not Sat Gurus conceive and contrive ways and means to enslave the followers and fulfil their individual agenda. They do not pave the way for the followers towards the Law, the Truth, and the bliss of self-realisation. They are to be discarded at once. The Sat Guru leads his followers towards the Truth, the "all permeating consciousness" who presides over the creation, having created it. He would lead his chelas towards immortality and eternity. He would lift them up from the wheel of birth and death"
Men with common sense, introspect, before they plunge into any action. It should be so even in relation to the Path to the subtle/supermundane world. Sat Guru creates the taste towards the Truth. Through his teachings, he inspires the pupils to follow the Law. He also encourages self-study, self-analysis, self-introspection and inaugurates the will for self-transformation. He gives the contemplative and meditational techniques to enable the pupil to dip into the super-conscious layers of him from the superficial layers of his mind. He does not encourage people to gather around him all the time. He would not also encourage them to publicise him and proclaim him as the great one. He remains simple and teaches simplicity to the followers, for Truth is simple. Aggrandisement of ones personality is foreign to the quality of the Sat Guru. A guru that aggrandises himself gathers around him people of similar quality who aggrandise themselves in association with him. Just as the guru tries to accomplish his individual agenda, the followers too, try to accomplish and fulfil their individual objectives. Thus, the community around the one who is not a Sat Guru would be like a social club, people fulfilling their individual tasks through social contacts and related influence. Such false teachers cast a shadow on the true teachers, which is not seen as a sin by a Sat Guru, but as a protection. The light feels secure when hidden from the profane. The Sat Guru knows that all that popular activity around him is like the foam around the water, which does not last long. He therefore does not allow excessive foam and fog to gather around him. In the Age of Kali there are many who proclaim themselves as gurus and distort the most sacred tradition of Teacher-student. A Sat Guru is known by the path he emphasises, by the simplicity he demonstrates and the transformation that happens to the people around him. Nicholas Roerich, the Russian yogi, who loved, lived and experienced the beauty, the gaiety and the divinity of the Himalayas, expressed his gratefulness to India, who still holds the rich Teacher-student tradition. According to him, it, is the only hope for humanity to walk into light. He says that India jealously and vigilantly guarded the rich tradition of Teacher-student, Gura-Sishya Sampradaya. An iron piece is effortlessly magnetised in the presence of a magnet, thus, in the presence of a Sat Guru, the chela is transformed. The process is simple, silent and is secretive. There is not much vocal and mental exercises relating to such silent transformation. The presence causes the transformation. Through the Sat Guru, such presence is always transmitted. Nicholas Roerich writes in his book "Shambhala": I have heard a lovely story about a small Hindu boy who found his Teacher. He was asked: "Is it possible that the sun would grow dark to you if you would see it without the Teacher?" The boy smiled: "The sun would remain as the sun but in the presence of the Teacher twelve suns would shine to me. "India's sun of wisdom shall shine. On the shores of a river there sits a boy who knows the Teacher." In the same teachings it is said: "Blessed are you, India! Because you alone have guarded the concept of Teacher and disciple". The Guru can dispel the attack of sleep. The Guru can raise-up the drooping spirit. Woe to him who has dared to lay claim, falsely, to someone as his Teacher and who lightly pronounces the word Teacher, while honouring himself! Verily flowers that spirit which understood the path of ascent and he fails who dropped in duplicity of thought. One may ask a Hindu boy if he wishes to posses a Guru. No word is needed in reply, because the boy's eyes will express desire, striving and devotion. The fire of Aryavarta will glow in his eyes. The stream of the Rig Veda will glow on the slopes of the mountains. (From the book "Shambhala" by N. Roerich). Nicholas Roerich belongs to the royal family of Russia. He was inspired to live in the Himalayas. He had the grace to find entry into the cave temples of the Mahatmas. To him, many wonders of life and light were revealed. He had the Darshan (the vision) of groups of beings of light. He is the only one, in recent times, who could physically experience the mysterious legends and the legendary figures of the Himalayas. He was inspired and even gave out inspirational teachings, which are propagated through the "Agni Yoga Society". His paintings are inspiring all over the globe. He is grateful for the grace showered on him and he upholds the rich tradition of Teacher-student. Sat Guru is thus everything for a truth-seeker. He is Truth itself represented. Truth is present in and around him. 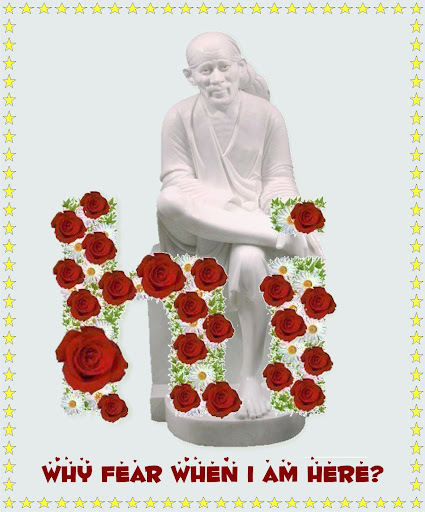 Sri Guru Datta is the universal principle relating to Sat Guru. What are names and function of Lord Datta? 1. Lord Dattatreya - One who provides frequencies of Divine consciousness! The One who controls the eight faculties in the body of an embodied soul and shows it the path to the unmanifest dimension through the manifest dimension. Avadhut is a medium that connects both the manifest form of Lord Datta and His unmanifest form. He is a manifest form (the gross manifestation) of the three principles - Brahma, Vishnu and Shiv. He is also related to the unmanifest dimension (manifestation of these three principles in the form of light). 'Avadhut' comes alive with the radiance of Lord Dattatreya. Is the principle which gives company to an embodied soul till it gets Final Liberation in the radiance of the sky, i.e. beyond all the directions. 'Sri' is the never-ending principle of God. The principle that takes an embodied soul to that principle of God or to the Holy Feet of 'Sri' principle is the Datta principle in Sripad. Lord Dattatreya bestows His grace on man by giving speed to the journey of his ancestors to the next region and reducing his distress from ancestors. God gives man a chance to get liberated from the debt of ancestors through the ritual that gives speed to ancestors onward journey and through chanting the Name of Dattatreya. Till the Satya Yuga, the spiritual level of all embodied souls was high and they acquired knowledge on the strength of their own spiritual practice. They possessed the state of 'Soham' (I am He). So Lord Dattatreya was required for the functions of dissolution and imparting knowledge to a very limited extent. Only the Vishnu principle in Him was active that time. As a symbol of this, the idol of Datta had only one head. Thereafter, during the Treta Yuga, the spiritual level of the embodied souls started to come down and they found it difficult to protect themselves and acquire knowledge on their own. To impart more knowledge to them through the subtle dimension, Lord Dattatreya had to bring out the dormant Brahma and Shiv principle in Him. To symbolise this, the three-headed idol of Dattatreya became prevalent. A. The ancestors get speed in their journey to the next region and this makes the atmosphere in the house pleasant. Adhyay 1 - Namdharak is blessed with the vision of Guru Nath. In this Adhyay, Saraswati Gangadhar ( Namadharak ) begins with invocation prayers for Divine Grace to endow on him merit and strength to be able to successfully compile the sacred Guru Charitra, the glorious account of Divine Incarnations of Lord Sri Dattatreya viz. Sri Sripada SriVallabha and Sri Narasimha Saraswati. Namdharak, an ardent devotee of Sri Narasimha Saraswati, sets out for Ganagapur for the Darshan of the Holy Padukas. Tired and exhausted and when he fainted away, Guru Nath appears before him in a dream and blesses him. Adhyay 2 - The Power and Glory of Guru Bhakti. Namdharak meets Siddha Yogi, the great and close disciple of Guru Nath. Siddha Yogi starts narrating the Guru Charitra to him, which the latter listens to with rapt attention. 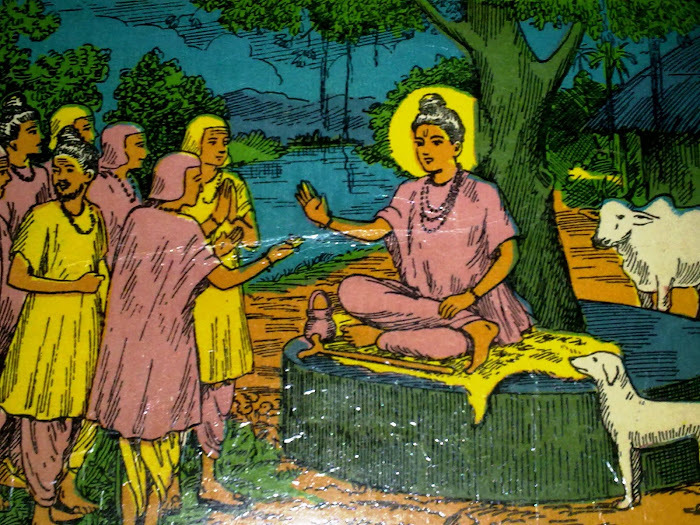 Siddha Muni Narrates to Namadharak about How Universe was Born,and How Four Yugas were Created with their Specific Trends and also narrates the Story of the disciple Deepak and the Guru Veda Dharma and about the unexcelled merit that accrue from Guru Bhakti and Guru Seva. Guru is indeed supreme and all the Gods are subsumed in Him. If we can but win Guru's Grace, we will have thereby won the Grace of all the gods. Guru is indeed supreme. The Names of Veda Dharma and Deepak have their own significance. Veda itself is both the Dharma and the Guru. And one who is devoted to the scriptures and abides by the Dharma which they enunciate, is sure to gain enlightment. Adhyay 3 - The Case for Shri Hari taking incarnations on Earth. 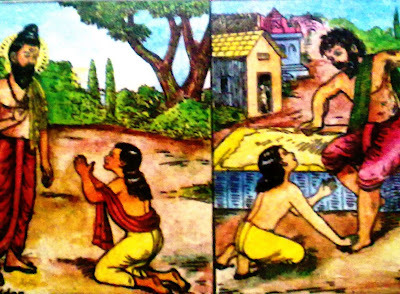 Once Durwas Rishi Came to a King called Ambrish,who used to Observe Ekadashi Fast.That day Sadhan Dwadashi was only for 24 Minutes after Sunrise.Fearing that his Vrata would be Broken, Ambrish took Holy Water and Dined before Durwasa,who went to River for taking bath and Performing Rituals .Seeing that Ambrish has dined before him Durwas cursed Ambrish to take birth in different Species.Ambrish Prays Shri Vishnu.Shri Vishnu said Durwas to Curse him Instead. Durwas asks Shri Vishnu to Descend on the earth Ten Times to Destroy the Evil and thus to give Relief to Everyone.This Led Shri Vishnu to take Different Incarnations. Page created in 0.55 seconds with 69 queries.